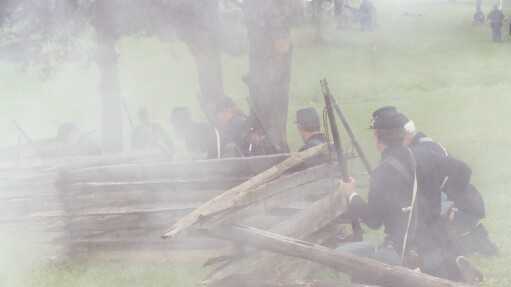 Welcome to the home page of the 28th NY Volunteers, Co. E.
We are a Civil War re-enactment unit dedicated to teaching the citizens of this country about the event which nearly destroyed this nation. We participate in a variety of activities throughout the year including battle events, living histories, seminars, lectures, parades and site dedications. This group was founded in the spring of 2002 with about 8 members and currently has around 70 people of all ages, abilities and interests. Within this organization we have people portraying soldiers, nurses, housewives, suttlers, craftspeople, washerwomen and newspapermen. There is a role for everyone wishing to live in, and learn about this time period. We participate in about 25 scheduled events a year, mostly in the upstate New York area centered around Rochester and mostly between the months of April and October. Many more events are available, depending on the ambition of the individual members. We do not expect members to attend every event, but we do have 4-5 "maximum effort " events during the course of the year where it will be very important for as many people to be there as possible. The 1860-1865 time period was part of the Victorian Age. This was known for modesty, good manners, detailed clothing designs and strict social decorum. Within this context we base our conduct while working with the public and other re-enactors. Politeness, decency, respect and honesty guide our activities. This has helped us rapidly grow our membership as people find that this truly is a unit where the members take care of each other, and we take care of other units that we work with. This hobby depends on large numbers of people from different organizations working together to make each event successful. Please check our event schedule to see where we値l be throughout the year. If you wish to try this hobby, want to ask us to attend your event, need a school lecturer on the Civil War, would like more unit information, or have any questions, feel free to contact any of these people below or visit our Reenactor Resources section for more information. Please e-Mail the website admin if you find any broken links or have any corrections, updates, observations.